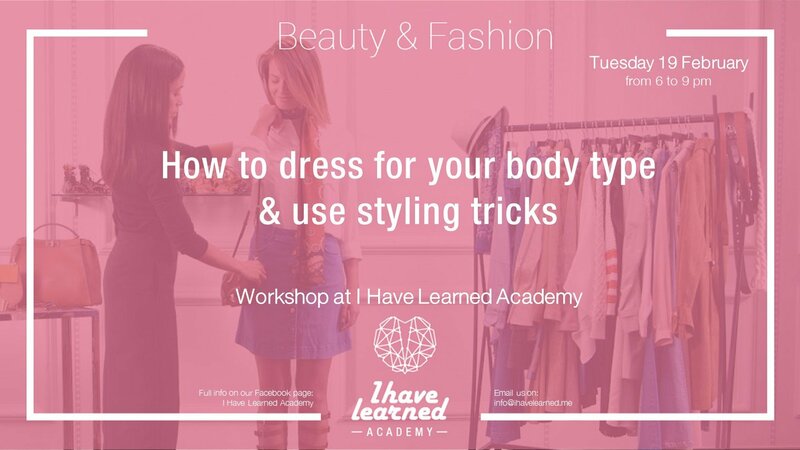 Learn how to dress according to your body type and shape! Join us on February 19th at I Have Learned Academy from 6pm to 9pm to learn more about your body type and know what suits you. - What you should avoid or wear more. This workshop is for both Men & Women. Carla K. is an Image Consultant and a Personal Branding Expert. Her mission is to help individuals, entrepreneurs and business people upgrade their style and image, build strong personal brands, and maximize their chances of visibility and growth. And Offline from Khoury Home or Malik's Bookshop any branch, or I Have Learned Academy. I Have Learned Academy is a place where you can learn everything that you didn't learn at school! I Have Learned Academy is located in Mirna Chalouhi Highway (The Bauchrieh - Sin El fil Highway).